Scientist, abolitionist, revolutionary: that is the Benjamin Franklin we know and celebrate. To this description, the talented young historian David Waldstreicher shows we must add runaway, slave master, and empire builder. But Runaway America does much more than revise our image of a beloved founding father. 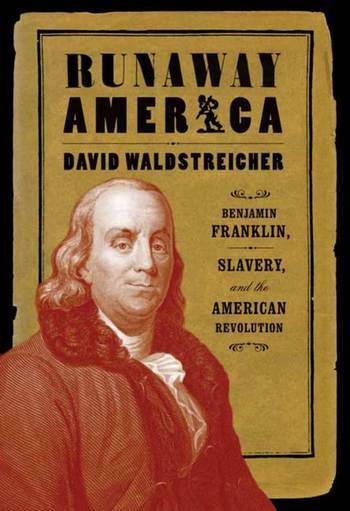 Finding slavery at the center of Franklin's life, Waldstreicher proves it was likewise central to the Revolution, America's founding, and the very notion of freedom we associate with both. Franklin was the sole Founding Father who was once owned by someone else and was among the few to derive his fortune from slavery. As an indentured servant, Franklin fled his master before his term was complete; as a struggling printer, he built a financial empire selling newspapers that not only advertised the goods of a slave economy (not to mention slaves) but also ran the notices that led to the recapture of runaway servants. Perhaps Waldstreicher's greatest achievement is in showing that this was not an ironic outcome but a calculated one. America's freedom, no less than Franklin's, demanded that others forgo liberty. David Waldstreicher, professor of history at Notre Dame, is author of In the Midst of Perpetual Fetes: The Making of American Nationalism and editor of Thomas Jefferson's Notes on the State of Virginia (Bedford Books).